Central Bucks West Collin MacAdams (left) handles the ball during their District 1 Class 6A quarterfinals on Friday. 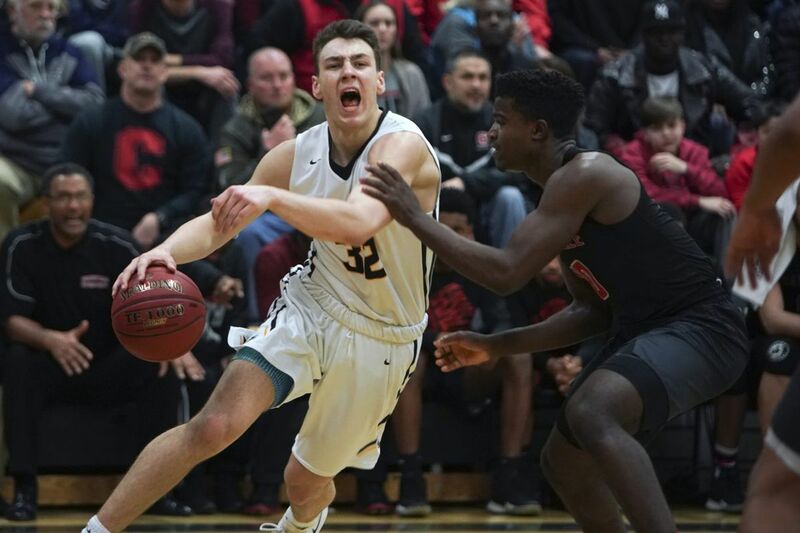 It was impossible to tell that Central Bucks West's Collin MacAdams was coming off a bout of mononucleosis that kept him in bed for 10 days, caused him to miss two games, and did not allow him to return to practice until Wednesday. "The doctors say I've had it for the last month and a half or two months," he said. "I didn't begin to feel real bad until the night before we were going to play in the Suburban One League tournament." Showing his usual versatility and toughness, MacAdams sparked the No. 4-seeded Bucks past No. 5 Coatesville, 48-41, Friday night in a PIAA District 1 Class 6A quarterfinal before a large crowd in Doylestown. The 6-foot-5, 200-pound senior delivered 19 points, including seven in the decisive fourth quarter, and nine rebounds as C.B. West punched a ticket to the district semifinals for the first time 2001. "He was huge for us," Bucks coach Adam Sherman said. "It's great to have him back." Two seasons ago, when MacAdams was a key reserve, C.B. West lost to Plymouth Whitemarsh in a quarterfinal on a buzzer-beating putback. "Ever since then, it's been a big goal of ours to get to Temple," MacAdams said. "This is amazing. It's super-exciting for the team, the school, and this community." The Bucks (21-5) will take on No. 1 seed Plymouth Whitemarsh (26-0) at 7:30 p.m. Tuesday at Temple's Liacouras Center. The Colonials downed No. 8 Upper Darby, 70-58, in another quarterfinal. MacAdams shot 6 for 10 from the field and 7 for 11 from the line against the speedy Red Raiders. Six of his nine boards came on the offensive end. The 18-year-old, who will continue his career at California University of Pennsylvania, said he "got a lot of shots up and did a little conditioning work" when he returned to practice two days earlier. With the hosts ahead by only two, Jake Reichwein's two free throws and MacAdams' inside bucket, off a nifty dish from Mika Munari, made it 43-37 with 1 1/2 minutes remaining. After Coatesville's Donte Crews drilled a three-pointer to cut the gap to 44-41 with 24 seconds to go, Munari converted two freebies and MacAdams put an exclamation point on the triumph with a breakaway dunk. Munari and Jack Mulhearn each chipped in nine points; the 6-3, 225-pound Reichwein managed six of his seven points in the final stanza; and Shane McCusker notched five points and the same number of boards. Of Reichwein, a standout linebacker in football who was celebrating his 19th birthday, Sherman said, "He's an awesome teammate. He made plays for us at point guard at the end of the game." The Bucks overcame 17 turnovers. "We knew that they were going to throw a lot of pressure at us," MacAdams said. "We just had to find a way to grind it out." Jhamir Brickus, a whirlwind floor general, paced the Red Raiders (20-6) with 21 points, including three three-pointers, and four steals. Fellow sophomore guard Dapree Bryant managed nine points, five boards, four assists, and three steals. Next for Coatesville, which last season reached the district final before losing to Abington, is a playback game Tuesday night vs. Upper Darby. C.B. West will be trying to reach the district championship game for the first time. In 2001, as the No. 14 seed, it bowed in the semis to No. 2 Hatboro-Horsham, 44-27, at Temple. In that year's final, John Allen and Coatesville bested Pat Carroll and the Hatters, 64-46. C: Jhamir Brickus 21, Dapree Bryant 9, Tyrel Bladen 2, Chuck Smith 2, Avery Young 4, Donte Crews 3. CBW: Jack Mulhearn 9, Mika Munari 9, Jake Reichwein 6, Collin MacAdams 19, Shane McCusker 5.